Going to Disneyland while pregnant can be hard on your pregnant body, but it can also be a special trip filled with once-in-a-lifetime memories. When I was pregnant with Graci in May of 2017, my husband (then boyfriend) and I took our last pre-baby vacation to “The Happiest Place on Earth” and spent two days in the parks. Ironically, we’d planned our trip the previous September, before we knew we would be expecting. (I didn’t find out until the next month!) I crossed over into my 32nd week of pregnancy on our second day in the parks. It was an amazing trip, but I learned a lot of information that I hope will help other expecting mommas make the most of their trip. Can I get on rides at Disneyland while pregnant? WARNING: Be sure to talk to your OBGYN before going on any ride. This article is not to be considered medical advice. The short answer to this question is a resounding, YES! There are definitely rides that you can go on at Disneyland while pregnant. Sure, you won’t be able to go on all of them, and rollercoasters may be a no-go, but there are still plenty of rides that you and your bump can go on. Below, I’ll break down the rides that are a no-go, as well as the rides that are considered okay to enjoy. 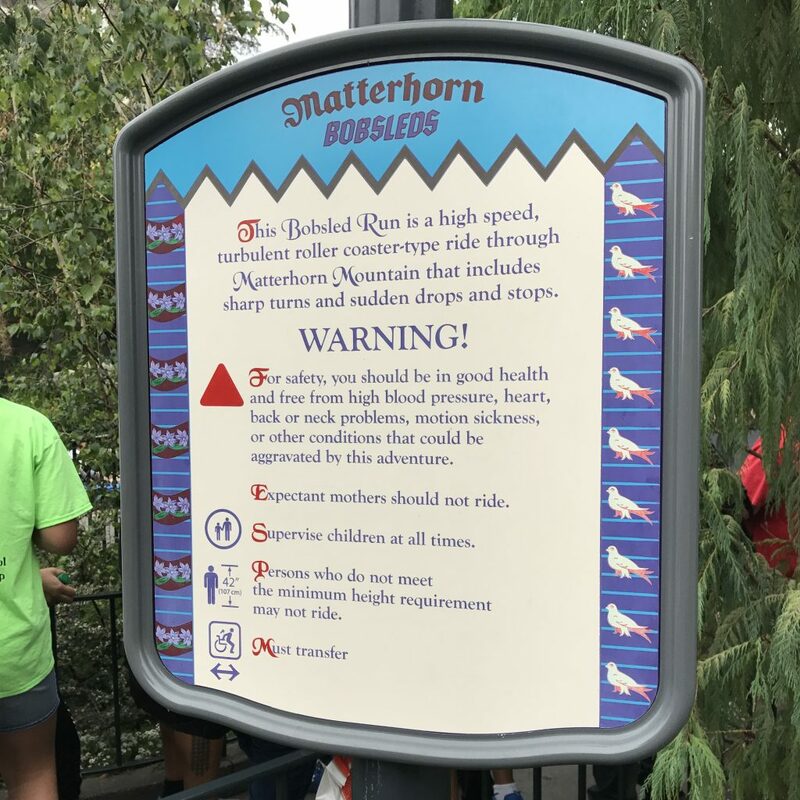 Disneyland’s Expectant Mothers Advisory is the warning that they use to indicate rides that they feel pregnant women should not ride. You can check out which rides are on their list at any time by going to this page or by using the Disneyland App’s attraction filters and selecting “Expectant Mothers Advisory” under “Physical Considerations.” Here’s a screenshot from the app! What Disneyland rides CAN you go on pregnant? What rides can I ride while pregnant at California Adventure? The same rules about the “Expectant Mother Advisory” from above apply to Disney California Adventure Park as well. 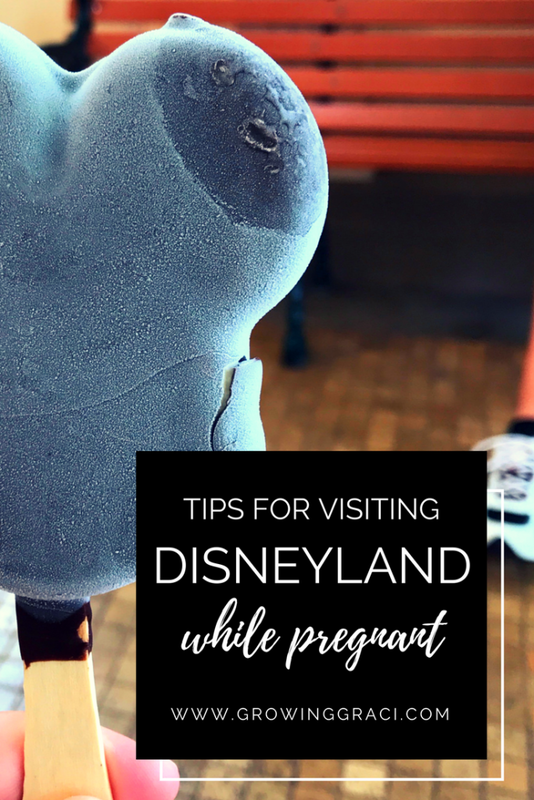 What can you do at Disneyland while pregnant? If you decide that you’d rather take a break from the rides on your visit, there are still plenty of things that you can do in the parks. Check out our tips below. 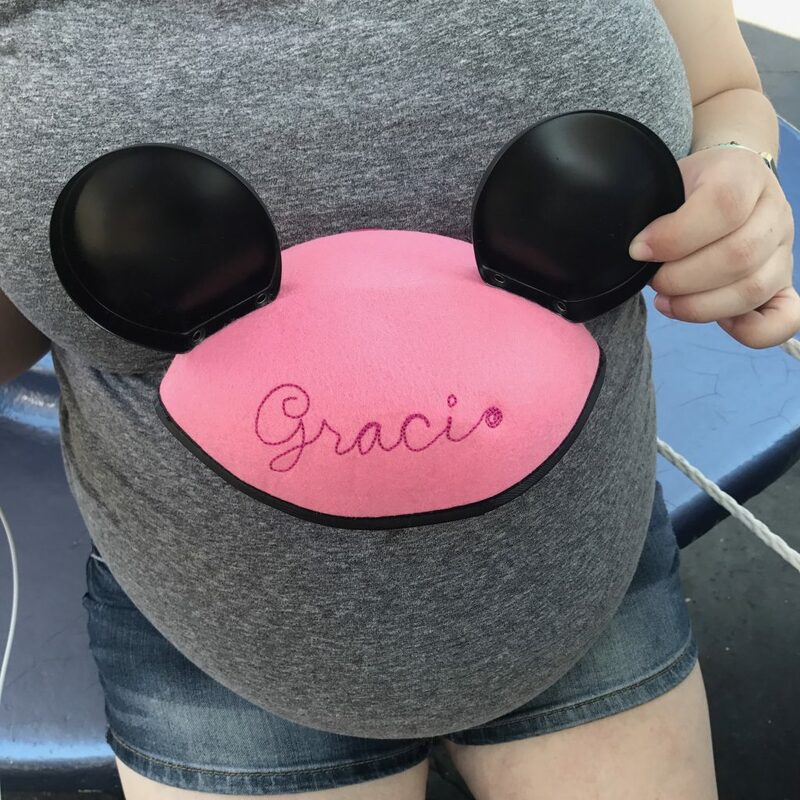 There are SO many cute way to announce that you’re expecting while on a Disney vacation. Imagine announcing your newest family member in front of Sleeping Beauty’s Castle, or in a photo with Mickey! Oh man. The possibilities are truly endless. Check out these super cute Disney baby announcement products from Etsy here. Any of these products would be adorable in a photo op! Visiting Disneyland while pregnant can be an incredible experience. One of the things you can do is take adorable photos with your bump! Disneyland treats taste even better when you’re pregnant. Trust me. If nothing else, Disneyland offers AMAZING shopping, and you’ve got a new little one to shop for! Make sure to check out all the stores in the parks and Downtown Disney for items for your new addition. Or treat yourself to something special because you deserve it, momma! This one is sort of a no-brainer. But, whenever you have the opportunity to sit down, you should, and you should do so in the shadiest place you can find. Being pregnant at Disneyland is tough enough without having to deal with a sunburn on top of it. My boyfriend and I opted to shorten our Disney Park days and to go back to the hotel around dinner time. While this wasn’t the most ideal thing in the world, we were both tired and since it was an adult trip, we felt like we should be able to call it a day if we wanted to! We know that this won’t always be the case when we return with little ones who’ll want to stay out as late as possible. If you are lucky enough to be at Disneyland when the Monorail and the Train are working, make sure that you take advantage of these! Whether you are using these modes of transportation to get around, or just as a nice place to sit and do something for a few minutes, these are valuable tools for a momma-to-be. The Monorail has two stops – one in Tomorrowland and one in Downtown Disney. The Train will take you to several stops around the park – Tomorrowland, ToonTown, New Orleans Square, and Main Street. When going to Disneyland while pregnant, you will want to consider how hard it is going to be to get back and forth to your hotel. You may need to take an afternoon nap, or just make it easier on your tired body when you head back for the night. There are a ton of hotels nearby Disneyland within walking distance, and if you really want to splurge, you can stay “on property” at one of the three Disneyland Resort Hotels – The Grand Californian, Paradise Pier or the Disneyland Hotel. Reduce the time you spend standing in line by using Disney’s free FASTPASS system. Check out more about how FASTPASS works here. The new MaxPass is amazing! You can make FASTPASS selections in the Disneyland App, and save yourself from running all over the park to get your FASTPASS selections. With your MaxPass purchase, you also get digital downloads of your PhotoPass photos – a great perk to use to get those bump photos! Check out more about MaxPass here. If only a few people want to ride a particular ride, make sure to see if that ride offers a Single Rider line. If so, the people who want to ride the attraction can get on quicker by riding individually. Find out more about Single Rider here. Over the course of your pregnancy, you can feel different. Depending on how large your belly has grown or your exhaustion level, you may feel better or worse depending on the stage of your pregnancy. While the information above about rides while pregnant is the same for EVERY trimester of pregnancy, here are some things you might want to keep in mind depending on the stage of your pregnancy. You may be feeling more nauseous at this stage, so you may want to make sure to pack some snacks and things like Preggie Pop Drops to ease the nausea. It may be super important during this stage of pregnancy to plan in a lot of breaks to sit down or head back to the hotel for naps. I was SUPER tired during the first trimester with my daughter! Many women feel their best during the second trimester, but this is definitely a very personal, pregnancy-specific thing. If you’re feeling best during your second trimester, it may be the best time to plan a Disney trip. For me, the third trimester was really difficult. My feet were always swelling and all of my symptoms were exacerbated. 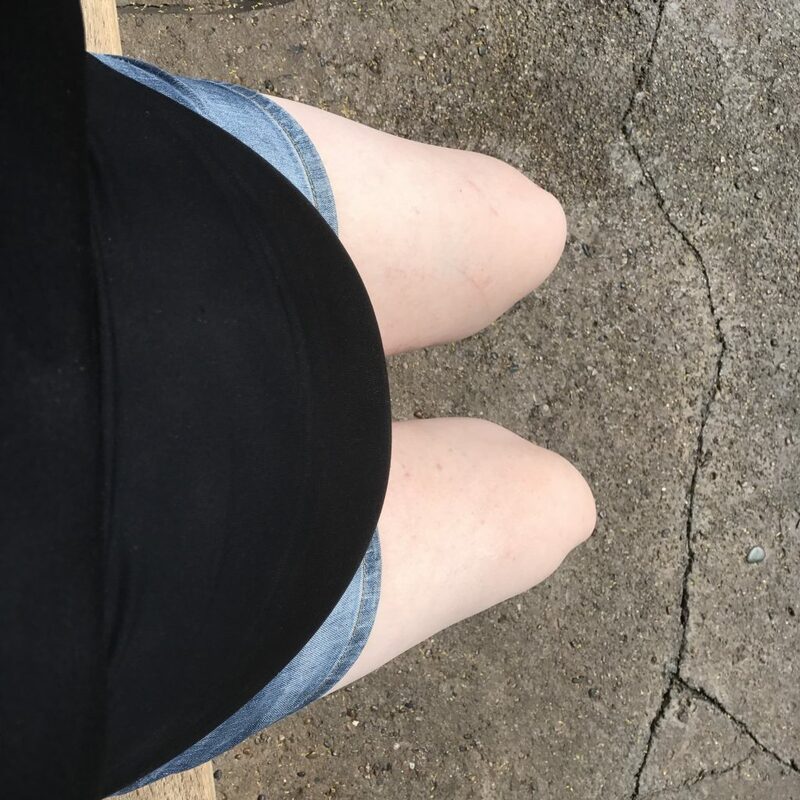 When we visited the park and I was at 32 weeks pregnant, being on my feet all day was hard. We ended up doing two shorter than normal days in the park. Staying hydrated was really hard for me when I went to the park. Make sure to keep drinking water, more than you think that you need. Keep in mind that you are going to have a harder time physically getting on and off the rides due to your growing belly. Visiting Disneyland while pregnant meant that I found all the best shady spots in the parks to wait and rest! My favorite spot was the sitting area near Radiator Springs Racers. Nothing good happens if your baby is born on Disneyland grounds. No free passes for life or any of the other rumored benefits. If you are close to delivery, I really wouldn’t risk heading into the parks. You wouldn’t want to go into labor and be stuck in a crowd or across the park from the entrance. There are a lot of rumors online about a “Pregnancy Pass” that will allow you to get to the front of the lines. I’m sorry to say that this doesn’t exist either. Chances are, Disneyland staff will suggest that you rent a wheelchair if standing in line or getting around the park gets difficult. Since it is likely that you are going to need to take more breaks than the rest of your party, it will be super handy to be able to charge your phone. We use solar battery chargers that are great for the parks because the sun helps to keep them charged. Check them out here. It is worth noting that Disneyland now has their own reusable batteries available in the parks, but they are expensive and won’t be as useful after your Disneyland trip. If you’re curious though, check them out here! I’m partial to Preggie Pop Drops and wrote a whole post about them here. Make sure to check them out on Amazon here. Here are my ABSOLUTE favorite shoes for Disneyland below. They aren’t the prettiest thing ever, but they are so comfortable and will keep you going! In fact, I loved them so much that they made my list of favorite pregnancy products here. 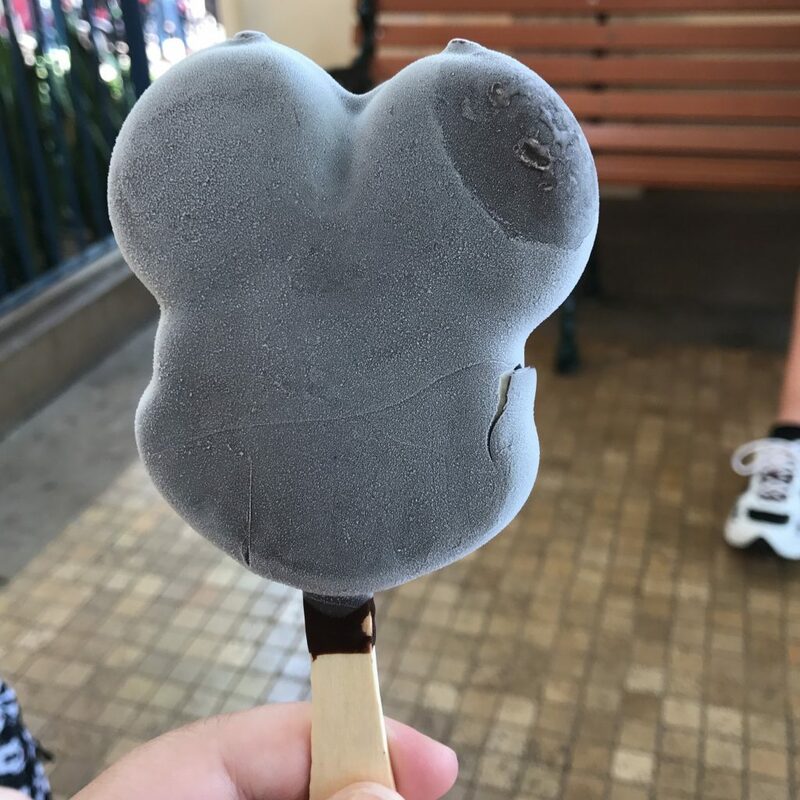 When we go to the parks, we like to bring our own snacks, but we like to try and keep our snacks Disney-themed so we still feel in the spirit. Make sure to check out these reusable snack pouches! Any water bottle will do, but here are a bunch of Mickey Mouse themed ones from Amazon! 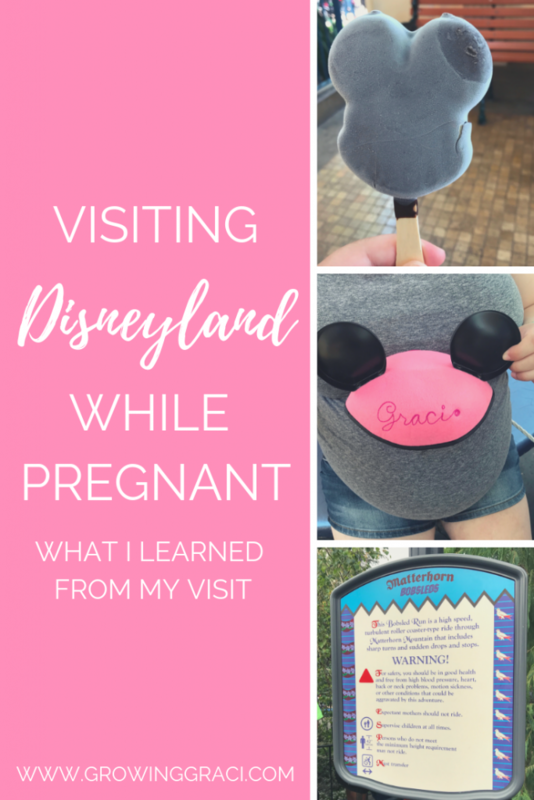 Have you visited Disneyland while pregnant? I’d love to hear your top tips below!